As you’ve heard from me every season, Lela Rose is always a favorite of mine. Each new collection is more exquisite than the last! While this season brought a lot of the same flattering, feminine silhouettes that have made Lela a go-to for many women (fit-and-flare dresses, crop tops + A-line skirts), it also brought some fresh new features. As someone who doesn’t wear pants too often (unless of the jean or leather variety, of course), I was surprised to find myself drawn to the several tunic + trouser combos that walked down the runway. I love the subtle rows of fringe on the matching white set! Lela always kills it with evening wear too. A few favorites? 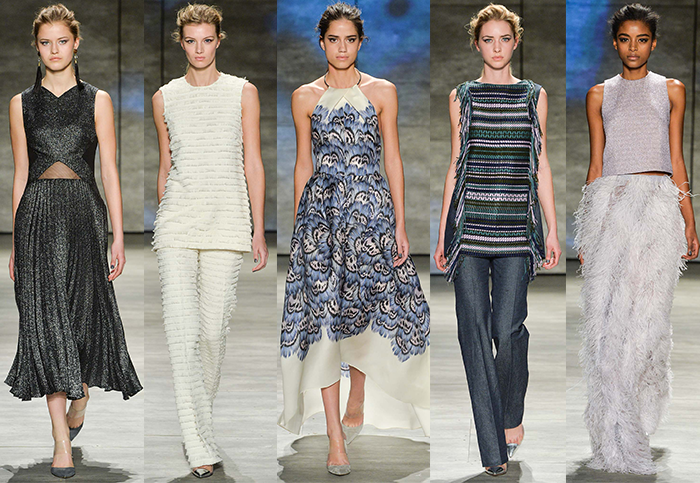 The ostrich feather skirt on the far right and the metallic pleated number on the far left. So gorgeous. The piece I’ll probably end up buying though, is the blue and white dress in the middle. It is so me! Be sure not to miss the Lela Rose spring/summer collection and pieces like this breathtaking floral jacquard gown. I’ve gotta say, I was very, very excited to attend the Milly show. I’m a big fan of the brand, but have never attended before this season! I’ll be honest in saying that I don’t own a whole lot of Milly pieces. I have one simple black silk top that I wear constantly throughout the warmer months of the year, and a dress or two, but that’s about it. The fall ’15 collection makes me want to own much, much more. Michelle Smith (the designer) always incorporates bold prints and color into every collection, but this one is the best yet. I love the sporty, electric vibes she fused with different textures and bonded fabrics. 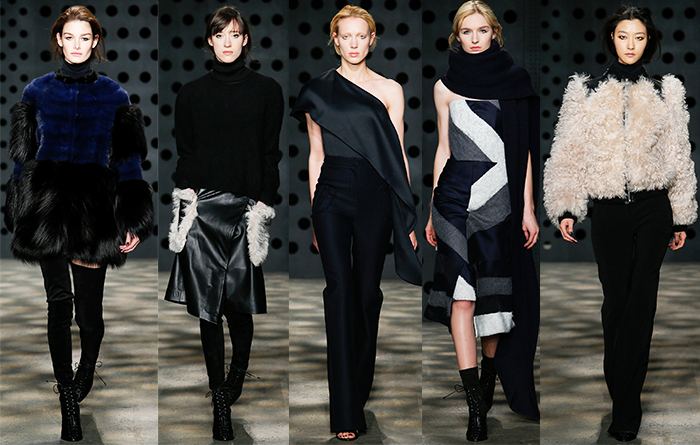 I’m most excited about pieces like the structured dress second from left and the molded black pieces (far right). Wearable and so, so fun! Be sure to take a peek at her spring collection too. Hoping to pick up these tuxedo pants soon! This is the first season I attended ADEAM‘s show and I was hooked immediately. Designer Hanako Madea just gets me. That fur coat! That leather skirt with shearling pockets! That jumpsuit! I want it all. Sleek, ultra-luxe and in all my favorite neutrals. I’ll definitely be saving up for at least one item from her collection – I wish I could buy it all! The setting was quite unlike anything I’d ever experienced at fashion week. 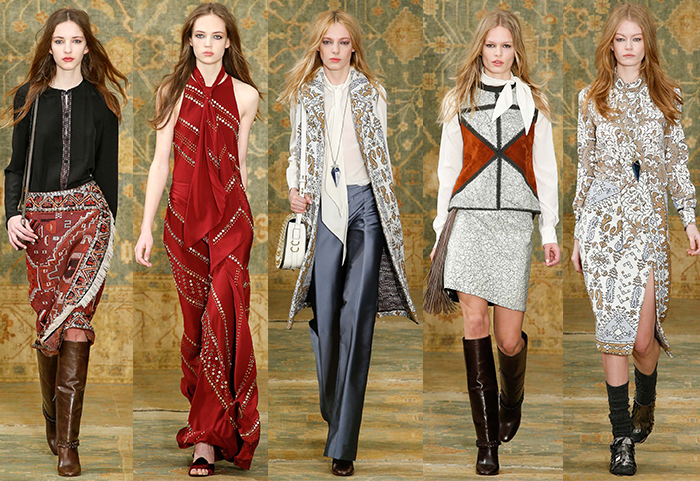 That’s what I have come to love about Tory Burch‘s shows (aside from the clothes, obvi). She makes it a setting that puts you in the mindset to prepare for the collection. 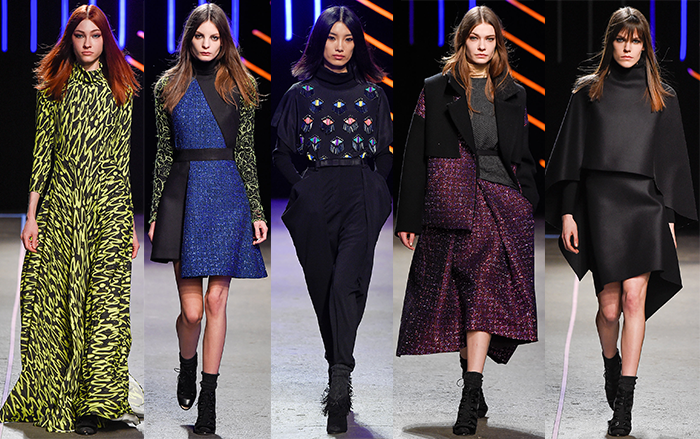 If you can’t already tell by the photos above, her fall ’15 collection was heavily influenced by Morocco. Kilim patterns and prints, rich colors, and tassels + covetable jewels aplenty. Also, I must mention that she had the best soundtrack of all the shows I attended. I was literally bopping my head to the beat, as were several other show-goers. Leave it to Tory to give us a full and fun fashion week experience! Don’t miss Tory’s spring/summer collection either – I’d love to have this fringed tunic + short set for summer. My friend Patti actually gave me her seat to this one (she wasn’t feeling great). 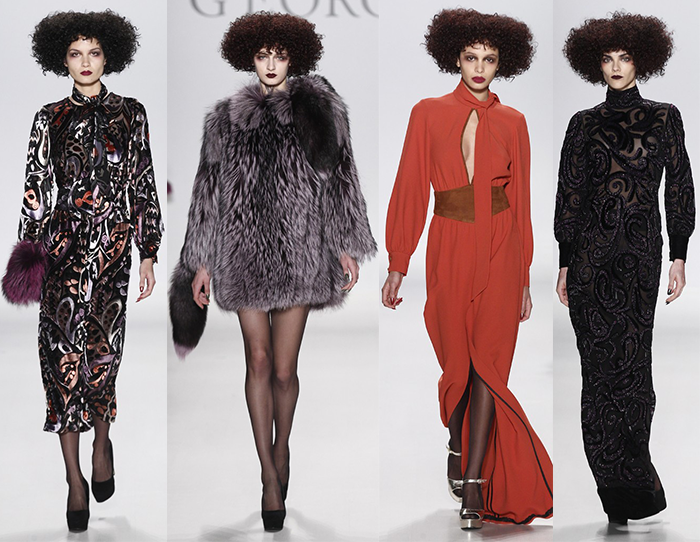 The Georgine fall/winter ’15 collection felt like it was straight out of the seventies. While some of the looks were a little too retro for me, I did love the silhouettes of many of the dresses. Also, can we talk about all the fur? You know I’m a sucker for a big fur coat or fur accessories. And Georgine did A LOT of them. Vivienne Tam was another new show for me to attend this season! My favorite thing about her collection were the Victorian vibes happening throughout. Extremely high ruffled necklines, embroidered mesh, and lace + beaded stockings were a high point. I’m dying to grab one of those blouses for fall! She created a gorgeous selection of cocktail dresses, perfect for winter weddings, and a number of wearable daytime looks like the plaid skirt + jacket and the camel cuffed trousers and quilted coat. Leave it to J.Crew to make sequins and lots of color totally appropriate and chic for the office! While I was not invited to the J.Crew presentation (someday! ), I did practically stalk the photos all of my blogger buddies took who did attend. Unexpected color combos like bright lemon yellow and pale pink were the hot ticket, but the shoes were something of a beautiful spectacle. Ankle ties, tassels, etc. And can we talk about those elephant trousers? They are amazing! Not sure I could pull that look off though. Can’t wait to see this come to life on JCrew.com later this year (especially this look – dying)! Speaking of JCrew.com, they are offering 20% off the entire website this weekend! I’m picking up this polished ivory double-breasted blazer, just in time for spring! Just enter code SHOPPINGTIME at checkout. 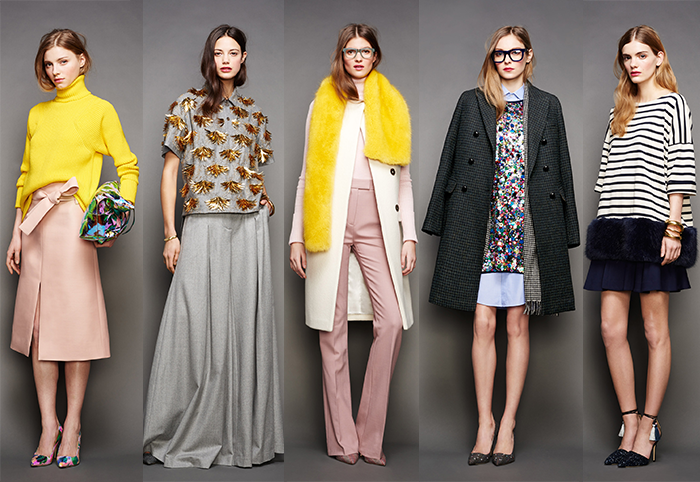 I want to get my hands on all of those pieces from J.Crew! I’m obsessed. Loved reading your favorite runway looks! Loving the fringe and pops of yellow! Have to say – J. Crew is my favorite!